Washer Disinfector front load and unload: pass through load and unload The Washer Disinfector is provided with an unload door and an additional cycle status indicator on the unload end, allowing one-way product flow from the contaminated area to the clean area. Washer Disinfector shall be provided with a combination of rotating jet spray and direct spindle spraying for all treatment solutions. The Washer Disinfector spray system consists of a single rotating spray arm mounted above, and interchangeable spindle wash or a rotating jet spray arms mounted below for internal treatment of the racked items. Opening the Washer Disinfector load-end door (or unload-end if pass-through unit), automatically stops operation of the washer. The Washer Disinfector door(s) must be closed, alarm acknowledged, and the Cycle Start button depressed to continue operation. A Washer Disinfector Emergency Stop button is provided on the load-end control panel (and unload-end if pass-through unit). If the Washer Disinfector operations of the wash cycle are interrupted by depressing the Button, the operator must reset the button and push the “Cycle Start” button to continue operations from the beginning of the selected cycle. A Washer Disinfector solid-state microcomputer control system monitors and automatically controls all process operations and functions. A Washer Disinfector twelve-cycle treatment menu may be programmed and retained to permit operating personnel to accommodate a wide variety of loads and processing requirements. Individual cycle phase times and temperatures and other key process parameters are programmable. Each Washer Disinfector cycle may be locked by supervision to ensure process integrity. The Washer Disinfector Cycle programming may be controlled by a supervisory access code. Each cycle program may be reviewed on demand. The standard Washer Disinfector treatment cycle consists of any or all of the following phases: Pre-wash, Wash, Rinse, Wash II, Rinse and Final Rinse. All cycle phases may be selected or deselected by the user. All Washer Disinfector Wash and Rinses treatments are re-circulated under pump pressure except the optional non-re-circulated rinse. The cycle, once activated, is completely automatic. Either Hot water from the house supply fills the Washer Disinfector sump, or Water remaining in the chamber sump from final rinse of the previous cycle is re-circulated through the jet system under pump pressure and pumped to drain upon completion. Phase is adjustable from 0 – 9999 seconds in 1-second intervals and 120F - 190F in 1F intervals. Hot water from the house supply fills the Washer Disinfector sump and is pumped through the jet system. As required, a specified amount of detergent is added during recirculation using the OPTIONAL LYNX- supplied, or customer supplied detergent injection pumps. At the end of the treatment, the detergent solution is pumped to drain. Phase is adjustable from 0 to 9999 seconds in 1-second intervals and 120F - 190F in 1F intervals. The Washer Disinfector Load is sprayed with either re-circulated or an OPTIONAL non-re-circulated sanitary water system. At the end of the Washer Disinfector treatment, the water may be retained in the chamber sump for use as the pre-wash water in the subsequent load or directed down the facility drain. The Washer Disinfector Re-circulated phase is adjustable from 0 – 9999 seconds in 1-second intervals and 120F - 190F in 1F intervals. The Washer Disinfector base, wash chamber and chamber sump are constructed of 304 Stainless Steel. The Washer Disinfector frame and cabinet, door and hardware are # 304 Stainless Steel. The Washer Disinfector is provided with vertical sliding doors. The Washer Disinfector is equipped with a dryer. 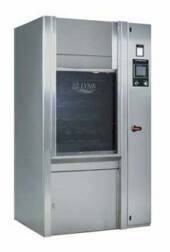 Heated air is re-circulated throughout the chamber at a user-selected temperature: The Washer Disinfector is provided with automatic power activated doors. The Washer Disinfector operator may open and close the door(s) by the push of a button. If the Washer Disinfector is a double door (pass-through) configuration the automatic door logic will be interlocked to allow only one door to be opened at a time. The Washer Disinfector is provided with a cold-water inlet valve, integral with the drain line to add cold water during draining for assistance in reducing the effluent temperature. Buy Surgical Instrument Washers that are: made in America, deliver reliable long lasting performance, built with nonproprietary and locally available washer replacement parts.